All the photos of the sphere have been shot and prepared and are ready to be Stitchd by a panorama software on one or several ranges. At that point, it is still not about using a virtual tour creation software like Panotour Pro because the panorama isn't Stitchd yet. But this type of software needs a flat image, possibly on 180 x 360°. Few of them offer stitching qualities, flexibility of use, productivity and can thus be considered professional, or at least, top-range. In this page, I'll tell you all about my experience and the qualities of each of them. 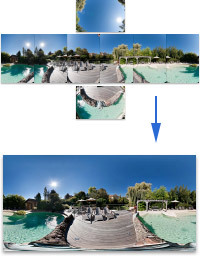 Here are the key points to remember about panorama stitching. The rest of this page is aimed at those who want to learn more. The only geometric projection to choose when you want to realize a virtual tour is the spherical projection during the stitching. Nowadays, the three best pieces of panorama software are PTGui, in English only, its direct competitor and Hugin 2018, very similar to PTGui but available in other languages. There are many of them and I imagine that most of you already have an opinion on the subject. Each will have its favorite because lots of stitching pieces of software, once mastered, are amazingly efficient. You can also be attracted to one panoramic piece of software but because of your lens and its distortions, have to choose a different panorama software, more powerful in this case... Firstly, the aim of this tutorial is to introduce a few pieces of software that seem to be reference and I'll complete that list as my reviews go along. * : partial stitching of the sphere hence not in 180° x 360°. My note : 9,0/10 - PTGui's first-time users love it and that's understandable. It was Autopano's competitor... but Kolor has just closed. We no longer have a choice, but it's serious because it's an excellent software. 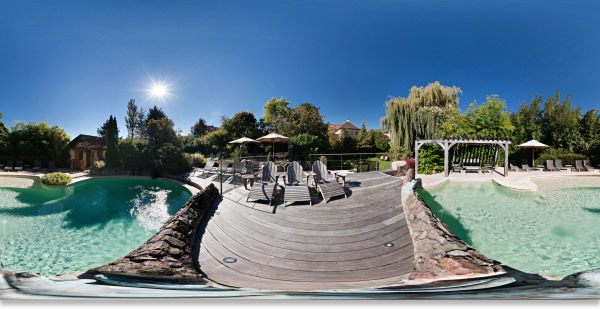 Photomerge is a Photoshop plugin that allows to Stitch panoramas, possibly spherical but Attention! not complete. Photomerge does not know how to correctly Stitch a complete 180 x 360 ° image for example. My note : 8,0/10 - There may be cases where we need to Stitch a panorama punctually and it is possible to do it with Photomerge, a plugin integrated in Photoshop. Photomerge lacks flexibility and possibilities, but what it knows how to do is often very well Stitchd in an interface that is easy to understand without a learning curve. Credible punctual alternative. Here again, it is very simple even though each software has its own stitching process, always pretty much the same nowadays. In this tutorial, I describe the process extensively with Autopano Giga. Caution! Unlike with a simple stitching, check that the geometric projection mode is the spherical one if you haven't Stitchd a 180° x 360°. In the event of a complete sphere, the software always chooses the spherical mode by default. The software will then start working and give its verdict moments later. You may then have to edit certain zones if you think they haven't been Stitchd well and check if the photo is correct. 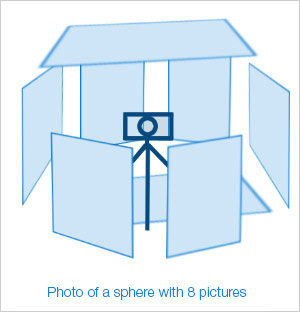 Important for the creation of virtual tours. Multilayer - very important - We'll see in the next page, dedicated to final edits, how primordial it is to make your work easier when editing stitching artefacts or unwanted items in the field of view.